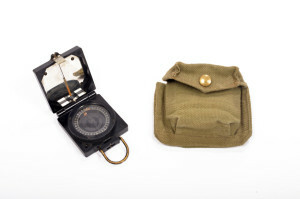 Should You Sell or Toss Grandfather’s World War II Memorabilia? Although those who can remember it are now among our elders, the historical earthquake of World War II will never be fully erased. Amid all the tragedy and suffering wrought by that great conflict, there’s a potential glimmer of hope: the memorabilia collected by the more than 16 million Americans who served. As you look through the family heirlooms that your ancestors have collected, you might just find a few gems amid the memories—even if they’re not as distinctive as these precious items. Although World War II was primarily fought with rifles, bombs and torpedoes, certain combat troops still required knives for close-quarters fighting. There were many different types of fighting knives used in the conflict, including the legendary Cattaraugus 225Q. Some have exquisitely carved hilts and straight, true blades that did their job admirably. Even if these blades lack precious metals, certain models are worth far more than their weight would suggest. Uniforms might not contain precious metals, but some of the more special ones could be worth a significant amount of money. Bomber jackets, formal Navy jackets and certain types of officers’ uniforms are in short supply. As a rule of thumb, rarer uniforms tend to be worth more than their common counterparts. As more of these items get “taken out of circulation,” however, their value may rise as a class. Medals are often made from precious or semi-precious metals, but their real value is contained in their symbolism. While it can be difficult to give away the item that encapsulates a relative’s sacrifice, World War II medals are among the most valuable pieces of war memorabilia. It’s a good idea to get any medal appraised. Even non-functional guns—especially sidearms with ornate handles and handmade parts—from the World War II era can fetch huge sums. As with coins and medals, rarity tends to fetch a premium. To determine whether your gun’s source and workmanship can be authenticated, it’s smart to get an appraisal. Whether you’re in possession of a potentially priceless World War II antique or an old coin that you’d like to get acquainted with, you can’t necessarily trust your gut—or the Internet—to get a proper accounting of its value. Fortunately, our precious metals and antiques appraisers are among the best in the business, and we take pride in giving fair, transparent analyses of a wide range of material. To learn how much your family heirlooms might be worth, call us at (716) 204-8800 or fill out our online contact form.